Why are puzzles important to student learning? 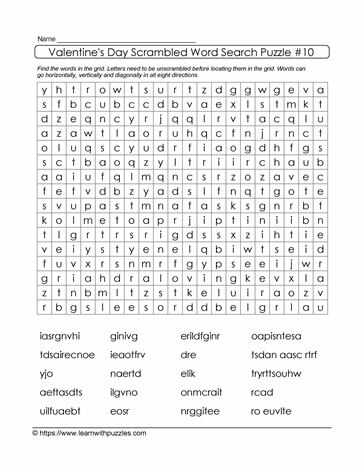 Educators often look to word search puzzles to introduce new vocabulary. These mind teasers also support consolidation of spelling. This Valentine Valentine's Day scrambled letters brain teaser has a list of words with the letters for each word jumbled. Students need to unjumble these letters and then locate the words hidden in the grid. Remember that if a clue has two or three words in it, those scrambled letters do not necessarily reflect the number of letters in each word. Students need to use additional problem-solving skills to solve the brain teaser.